Luton Town’s future is once again out of their own hands with a thoroughly disappointing defeat to local rivals Stevenage at Kenilworth Road this afternoon. After battling hard in recent weeks to be the masters of their own destiny, once former Hatter Luke Wilkinson had powered the visitors ahead after just two minutes, it never really looked like Hatters were able to muster a meaningful response. Ben Kennedy’s late stunner put a gloss on what was an excellent display from the visitors, who made it eight wins in nine games, to leapfrog their hosts, with Luton falling five points behind third placed Portsmouth, 4-0 winners at Colchester, albeit with a game in hand. Boss Nathan Jones made one change from the 4-0 win at Yeovil last week, with Dan Potts in for his first start since New Year’s Eve, replacing Jake Gray, as Glen Rea moved up to the holding midfield role and Alan Sheehan going to centre half. However, after dominating a poor Glovers side last week from start to finish, Town’s midfield found the Boro quartet a much tougher nut to crack, as the likes Steven Schumacher, Charlie Lee and Jobi McAnuff had far too much experience and nous for the hosts all afternoon. 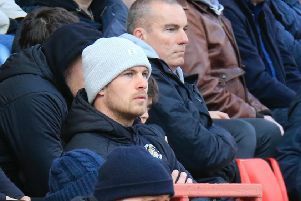 Boro had the lead on just two minutes when Wilkinson, who made a name of scoring at the Oak Road end from corners during his time with Luton, did just that. The visitors’ swung in a decent delivery and with Town stopper Matt Macey unable to get through a crowd of players, he was left helpless as the centre half, whom Jones had released soon after taking over at the club last year, powered his header into the net. Stevenage continued to look dangerous, Jobi McAnuff seeing his shot charged down by Sheehan, however, on 10 minutes, Hatters almost levelled, when Pelly-Ruddock Mpanzu headed O’Donnell’s cross past Chris Day, but not Jack King, who was stationed on the line. Macey then had a let-off, as he sent a free kick straight to the feet of Kennedy whose chipped reply from 30 yards out didn’t miss the target by much. Wilkinson was involved at his own end, deflecting Rea’s thunderous drive behind and then Boro were indebted to a fine stop from 41-year-old Day, who somehow beat the clean through Vassell in a race to make a crucial sliding intervention and deny Town’s speedster a certain goal. With Boro looking the more accomplished side the first period, Luton’s efforts were mainly from range, Potts’ effort taking a deflection and tipped over by the back-pedalling Day. Hatters were almost given a taste of their own medicine, as Stevenage broke with real pace only to mess up a three versus two chance, Rea just getting back in time, Lee firing the loose ball over. Sheehan wasn’t too far away with another free kick from 20 yards, while Luton had a great chance on the stroke of half time, Vassell bursting away and crossing for Hylton, who teed up Jonathan Smith to drag disappointingly wide. Macey shovelled McAnuff’s dipping volley behind, but sensing his side needed a more attacking threat in the second period, Jones brought on Luke Gambin for Potts, with Sheehan going to left back and Rea dropping into partner Cuthbert. Town produced an excellent free kick routine with Cook’s low delivery dummied by Vassell but not Hylton, Lee throwing his body on the line, not for the first time, to deflect behind for a corner. Unusually, set-pieces were looking Hatters’ most likely route back into the game, Hylton climbing well to direct a header that was nestling inside the far post, but for Schumacher, as King had done, headed off the line. Vassell then had a rare chance to utilise his pace, sprinting on the outside of Ogilvie as his cross shot only narrowly missed the lurking Hylton along with the far post too. Town were then dealt a blow on 70 minutes as Cuthbert limped off with what looked like a hamstring pull and was replaced by Justin, with the corner headed marginally wide by the excellent Wilkinson. Ollie Palmer was thrown on for the final 15 minutes and almost netted with his first touch, meeting Vassell’s wonderful cross from the left as he looked for all intents to have scored, only to see Day stick out a left paw. The Stevenage keeper was flying across his goal once with six to go, but this time Hylton’s volley didn’t require repelling. Boro then put the result beyond any doubt when Kennedy took aim from 20 yards to blast past Day, before sprinting the length of the field to celebrate, some recovery from an attacker who had gone down twice just moments beforehand asking for treatment. Hatters tried for a late consolation, as Vassell’s header turned aside by Day, with the keeper proving unbeatable, denying Palmer and Hylton as the ball just wouldn’t go in for the now dejected hosts. However, Luton now need to regroup and regroup quickly, for what is another hugely vital game at faltering Carlisle United on Tuesday night. Hatters: Matt Macey, Stephen O’Donnell, Dan Potts (Luke Gambin 46), Alan Sheehan, Scott Cuthbert (C James Justin 70), Glen Rea, Pelly-Ruddock Mpanzu, Jonathan Smith, Jordan Cook (Ollie Palmer 75), Isaac Vassell, Danny Hylton. Subs not used: Stuart Moore, Jake Gray, Jack Marriott, Lawson D’Ath. Boro: Chris Day, Jack King, Luke Wilkinson, Jobi McAnuff (Henry Cowans 90), Steven Schumacher (Michael Tonge 89), Tom Pett, Ben Kennedy, Connor Ogilvie, Charlie Lee, Matt Godden, Ronnie Henry (C Dale Gorman 65). Subs not used: Callum Preston, Kaylen Hinds, Kgosi Ntlhe, Ryan Loft. Booked: Pett 8, King 41, Kennedy 86, McAnuff 90. Attendance: 9,045 (699 from Stevenage).